Midday, Mohammed arrived with Califa, a small chain-smoking man with few teeth and a steady grin. He spoke no English nor Portuguese. There was a sweet nature about him. He wore a baseball cap on his bald head, a blue collared shirt, a fanny pack, and ripped shorts. He was a good captain, Mohammed inferred, as he’d fished around Ibo his entire life. The clouds split, the sun dazzlingly bright on the crumbling, washed-out coral rag walls of ruins. We walked down the old cement ramp to the lagoon where Califa’s cluttered, heavy white fiberglass panga, weak with an ancient 25-horsepower Yamaha, floated in a foot of green water. Sections of the hull were translucent from unpainted repairs. The boat contained no safety items nor comforts. “The continent,” Mohammed said proudly, squinting and smiling, his long skinny arm and finger pointing at the low, flat mainland five miles west, the terrestrial piece of Quirimbas National Park, home to elephant slaughter (ivory). Between islands, small, clean swells slid from the Mozambique Channel. Equidistant from Ibo and Matemo, we passed Songosawi, a submerged reef with an exposed curl of beige sand on its west tip used by tourists and locals for picnics, snorkeling, relaxation. I saw whitewater two miles east of the sandbank. Passing terns squawked over the wheeze and whine of the Yamaha. In the distance, Matemo was a long, thin black line. We skimmed over delicate sparkly wavelets in the shallows, morphing blue as clouds dissolved and the threat of rain marched east, away from the lung-shaped isle, which enlarged as Califa steered us toward it. I could see uneven groves of coconut palms and thick green vegetation atop bright white sand that sloped into turquoise water, lightening into shallow sand flats of classic hue. It could have been a bonefisher’s paradise. Twelve miles from Ibo, Califa beached the panga on a finely ribbed sandspit that produced two-inch-tall, perfectly shaped tubes—a warmer, bluer, micro-Pelican Point (of Walvis Bay fame). He stayed with the boat. Mohammed and I avoided small black urchins as we walked slowly toward the calm, leeward north beach of Matemo, quivering in the heat, a mirage as the sun boiled our backs. Nothing was said as we approached 24 abandoned, decaying wooden villas among casuarina and the trunks of headless cocopalms. Until 2013 the beach was an upmarket South African-owned hideaway, its private air-conditioned verandas facing this surreal scene where fishermen in dhows plied between islands, the knifey silhouettes of their sails iconic of the Swahili Coast. When it was open, full-board rates started at US$450 per person per night. Later I emailed a woman named Laura who worked for South Africa-based Mozambique GSA, the resort’s former booking agency that managed 12 other luxury resorts in the Quirimbas region, plus several in the posh Bazaruto Archipelago and southern Mozambique. Sans tourists, Matemo’s north beach was pure tropic idyll, nice for a Sports Illustrated bikini-issue shoot, clean and silent but for birdsong and breeze. Ghost crabs hid in holes they dug in the still-damp white sand. It was a breeding site for sea turtles. Uniform scatterings of dry green seaweed denoted the great tidal shifts, and at dead low the brown flat reef extended far to the northeast, its edge open to swell. The wind was nil, the light flat. Sun seared my skin. I had no water nor sunglasses. A barefoot white-stubbled man in wet gray clothes walked up the beach toward us. He had fished all morning. Atop his head, with his right hand he balanced five basket traps lashed together. In his left hand was a white bag of small fish. He was friendly and his teeth bright white, contrasting his darkness in the fish-trap shade. We greeted him with salaam and he briefly chatted with Mohammed. He told me the man was 70 years old and had never left Matemo. A cluster of small thatch huts occupied a clearing just above the high-tide line. Nearby, hundreds of tiny flyblown silver fish were drying on the sand; the stench was overwhelming. After five days, Mohammed promised, the fish would be delicious. Matemo is the second-largest of the Quirimbas and 100 percent Muslim—village life revolved around fishing, farming, prayer. Compared with atmospheric Ibo, Matemo was more desolate, quieter, windier. Its people seemed wary of a wandering mzungu, adrift from the alienation of a dead resort. After a mile we walked into a village, one of the isle’s four. Freshly washed clothes were draped on plants to dry. Roosters crowed. Wind fluttered the trees. As with most leeward parts of islands, Matemo’s solar-powered north was arid and dry, its flora desert-like. There were sisal and cacti; errant thorns lay in the hot yellow dust. There were parched grasses and dying trees; hungry bony goats kicking the dirt, looking for scraps. In the village of thatch-roof mud huts, Mohammed knew several people. He spoke with them. They mostly avoided eye-contact with me. I was a ghost. “Is okay. You take picture.” Grinning, he mimed holding a camera and pushing its shutter button. Click-click. One in the group, a shy, grinning young man named Momade in a white collared shirt, asked me to email my photos to him so he could upload them to his Facebook page. He gave me his full name and email address from an old scratched phone, but later I could not find Momade on Facebook. His village appeared clean, vibrant, and happily off-grid, a daily rhythm of fishing, low-tide reef foraging, dhow repair, dhow building, vegetable farming, coconut collecting. There were no cars—few motorbikes. Matemo was flat and scorched but a lovely outpost of serenity and sweet souls. Perhaps it was for the best that the resort was shut. That land private. Racist South Africans. Local people have no go there. Long, dazed walk back to the skiff, the sand white-hot and eye-stinging, like snowblindness. Terns whizzed past our heads. Thirst gripped our throats. Communication was hard—best to be mute and let nature speak to us. The tide had dropped in the time we’d been away from the panga, the sandbar now a vast marine barren. Through the haze I saw whitewater and knew the top of Matemo’s reef had surf. To Mohammed I suggested we boat out for a look; he didn’t understand even as I urged—“Ondas! Ondas de lá!”—and pointed from my board to the whitewater. He said Califa refused, citing fuel concerns, and it was still a long ride back to Ibo. The wind and chop had increased so we banged straight into it. 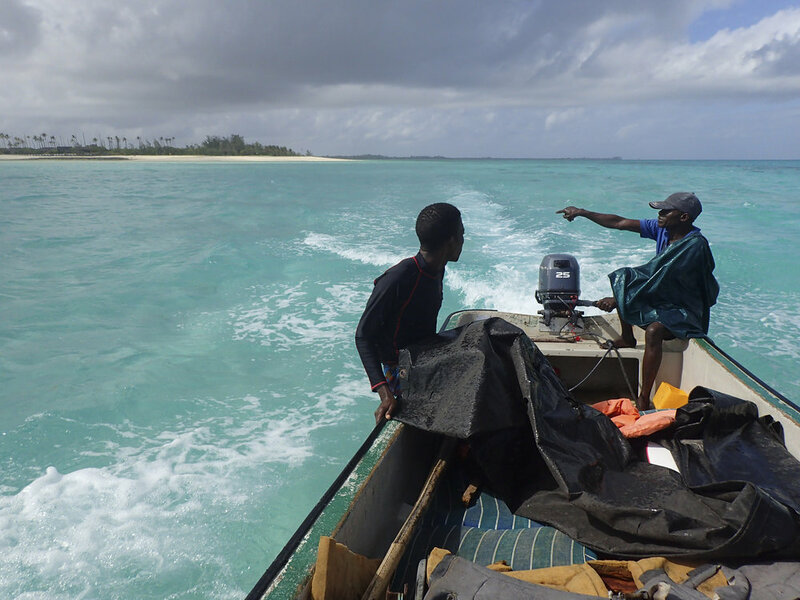 We passed a patch of shipwrecking reef near a small canoe holding two men with a fishing net. They stared at us. Their friend, wearing a snorkel mask, stood on a coral head, holding a crude spear gun. Their lives and sustenance revolved around tides. For surfing, low was ideal. Nearing Songosawi, there came another hallucination: defined turquoise rights breaking along the edge of the distant, prismatic coral flats—blues and greens and brownish pinks. Atop the shadeless shoal, five sweaty men dozed, a break from fishing. Califa beached our boat aside theirs. From the sand's slight rise, I could clearly see the mirage—soft but well-shaped, consistent, long rights—to the northeast. A 1.5-mile-long trapezium of exposed coral surrounding the wave was blocking wind chop. Smallish swells slipped from the southeast and wrapped nearly 180° around the top of the reef, the wave faces brushed by trades, the spindrift a magical sign of life. After my directive pointing and a few choice words—“Sim, boas ondas lá!”—we boated to it.